I've never used Crab Apple trees in any of my container gardens, but a customer really wanted one -- and I was excited to see how a tree like this would do in a planter. Crabapples are part of the Rose family, genus malus. Any fruit over two inches in diameter is considered an apple. I found the perfect tree at one of my nurseries in Dix Hills. While the fruit on it was more like a rose hip than an apple, this one was the perfect size with a lovely, elegant shape. My customers were delighted. But a few months later I got the call that there was something terribly wrong with their crabapple. (See photo above of what they saw; the top photo is the gall just after rain in spring.) 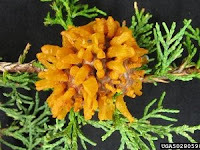 From their description was pretty sure it was cedar apple rust. 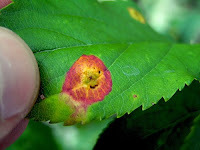 Cedar Apple Rust is a fungus that starts on cedar or juniper trees and jumps to apple (and other fruit bearing trees). It's a rough looking brownish gall until spring rains hatch it into a mushroomy orange "thing" that bursts open. The fungus spores travel over large areas (miles) and come to rest on apple trees, discoloring them and, over time, stunting the fruit and the tree. Inspecting every cedar and juniper within a several mile range of downtown NYC was not an option (pulling off and destroying the gall before it "hatches" is one preventative measure). Instead, we ordered some Kop-R-Spray (considered to be the most effective stuff on the market) from California. It couldn't be shipped by air (regulations) but when it arrived there was enough for us to open our own cedar apple rust spraying company. After spraying, the fungus disappeared within a week -- & it seemed like a miracle. Next spraying: Spring after the first really good rain hatches its batch of fungi -- some no doubt heading directly for our little crabapple on Broome Street. We're ready for them this time.